Tashi Lapcha Pass trek is situated in the west piece of the Khumbu, straightforwardly on the Tibetan outskirts. There is a wild, desolate high valley the “Rolwaling” which is basically called “the grave” by the indigenous Sherpas. It’s so because of its area – covered down between soak ice-monsters. Bharal Adventure urges travelers across the globe to brace yourselves for an amazing journey of Khumbu’s iconic place. Simply the ways to deal with the Rolwaling Valley are justified regardless of your cash. The trail drives you through an abundance of assortment on one hand through Tamang and Chhetri towns. With their normal porch rice fields, on the other through thick, melancholy primitive backwoods and over wide Ridgebacks. Two varieties are conceivable. The first is a four day trek from Jiri (1860 m) over the Chordung Ridge (3698 m). Suri (1890 m) and Gonger (1040 m). The other is a six day climb beginning from Charikot (1850 m) by means of Tinsang La (3319 m), Bigu Gompa (25l9 m), Chilangka and Gonger. Be that as it may. We are doing this trek from Charikot so you can let us know whether you want to begin from another way. You at last set foot into the Rolwaling through the town of Simigaon (2000m) found high over the Bhote Khosi. Over the Shapka Meadow (2600 m) the way separates. For while, it is surely more strenuous it is likewise emphatically the all the more fulfilling. Following a four-hour climb, you will come to the Daldung La (3976 m). It has a phenomenal perspective of the 7146-meter high Gaurishankar inverse. During such magnitude of trekking expert team of Bharal Adventure will always make you feel safe and secured. From here you have a staggering perspective of the mountain-mammoths Chekigo (6735 m), Bamongo (6400 m), Kang Nachugo (6735 m), or more all, Tsoboje (6689 m). From here we make a beeline for Tashi Laptsa known as Tesi Lapcha La (5755m) the most daunting pass of this district. In the wake of intersection the past us at that point get to Thame, Namche lastly to Lukla where we get our mountain flight to Kathmandu. Book the Tashi Lapcha Pass Trek package with Bharal Adventure. Hence, get an intrepid medal of conquering the most difficult high altitude pass of Khumbu region. On arrival at Kathmandu Tribhuvan International Airport, where our staff and guide will receive you with warm welcome, and then a short drive in the heart of Kathmandu city to reach your hotels, with time to get refresh and then our guide will brief you with detail information regarding Tashi Lapcha Pass Trek, hotels, lodge on Route trekking with do’s and don’ts includes evening welcome dinner in an authentic Nepalese restaurant with cultural and folk programs. In Kathmandu morning sightseeing tour after breakfast , where our city guide will take you to interesting and exciting places, as Kathmandu steeped with historical and world heritage sites visiting Old Durbar (palace) Square, and ancient stupa of Swayambhunath, after a tour head back to hotel with preparation for Tashi Lapcha Pass Trek next early morning. We will hire a bus for a road trip to Sigatte. We will visit the famous temple of Bhimeshowr in Dolakha on the way to Sigatte. We will camp on the banks of Tamakoshi River. The journey follows the Bhotekoshi River Valley. We will trek via terraced farmlands, villages and small hamlets. Green lush forests and sight of Mt. Gaurishankar is majestic scene on this day’s trekking. Overnight will be in tented camp. The trail is full of rhododendron and bamboo forest. From this day onwards we will enter the Rolwaling Valley. Our overnight will be at Donga on the banks of River Rolwaling. We will trek further ascending via green lush forests and gazing at the majestic mountain scenery. Once we reach Beding the sight of Rolwaling’s highest mountain Mt. Melungtse I. We will stay in tented camp but the time spent on this village where lots of Everest summiteers are present offer amazing hospitality. We will acclimatize at this village by doing small hike towards Malung La Pass. The view of mountains, Beding Valley, Forests, Glaciers and magnificent landscape are rewards of this day’s hiking. Today we will take our journey along the river trail. We will be able to explore the virgin glacial lakes on the way. The village of Na is situated beneath the Tsho Rolpa Glacial Lake. The view of mountains like Chugimago, Yalung Ri, and Chobutse are spectacular. We will stay overnight near the Sherpa Village from where mountain vistas are seen marvelous. We have to take another acclimatization hiking on this day. The day ahead will be high altitude trekking and enough acclimatization to the situation is highly required. Bharal Adventure appointed guide will take you all to Yalung La Hiking. The view of Mt. Ramdun and Tsho Rolpa Glacier is an awesome reward on this day. We will ascend towards the dam site which is holding the Tsho Rolpa Lake. The dam protects the lake from bursting and damaging the whole valley downwards. We will walk through moraine to reach our camp site which is located in between Trakarding Glacier and Tsho Rolpa Lake. We will trek to Trakarding Glacier which is very marvelous rocky region and we will see the various bluish icy landscape. Through rugged rocky trail, we will reach the campsite on the side of Drolumbau Glacier. Incredible scenery of mountains everywhere will make your stay interesting and captivating. It is the most challenging day of our trekking and the most craved destination too. After days of walking, we will finally arrive at Tashi Lapcha Pass. From the top of the pass, one can get the panoramic view of mountains like Dragkar-Go, Bigphero-Go, Tengi Ragi Tau and others. The mountains on the Tibetan side give spectacular scenery to capture in your mind and camera. After such daunting walking yesterday we will walk very comfortably on this day to reach Thame. This place is on the route to Renjo La Pass from Namche Bazaar as well. For Tibetan traders, this is the best route for trading into Khumbu Valley and Tibet via Nangpa La Pass. This is probably the easiest day of an entire trekking. We will take short uphill hike and downhill to Namche Bazaar. We will enjoy the sight of Thamserku and Kwangde from this delightful Sherpa Marketplace. Once we are at Namche we will take you to Everest View Hotel for the panoramic view of Everest and other mountains. This is the best place to witness entire Khumbu region. 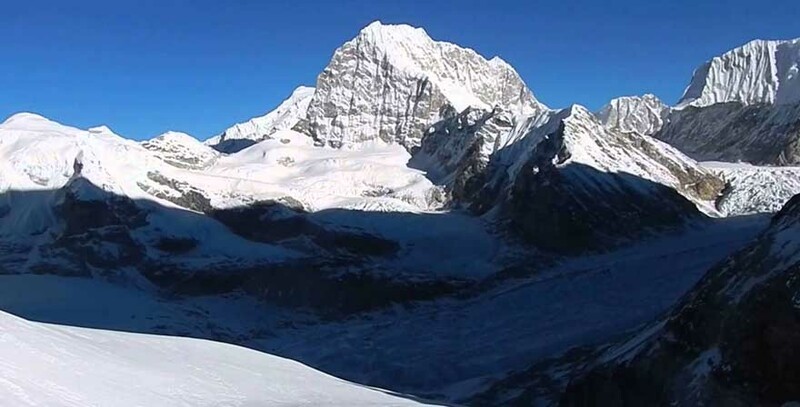 Amadablam, Tabuche, Lhotse, Nuptse, and others look spectacular from this place. On the way back to Namche we will visit the Everest Museum of Photo Gallery. We will descend back to Lukla following the Dudhkoshi River and trek past Manjo, Sagarmatha National Park Entry point, and Phakding. You can enjoy the trip and day with delicacies and music with crew members. Last day in Nepal, the country full of excitement and Himalayan wonders, after an overwhelming experience with memorable time on Tashi Lapcha Pass Trek, our staff transfer you to the airport as per your time for the international flight for your final departure towards homeward bound. All cold drinks such as alcoholic beverages, mineral water, Coke, Fanta, juice, etc.